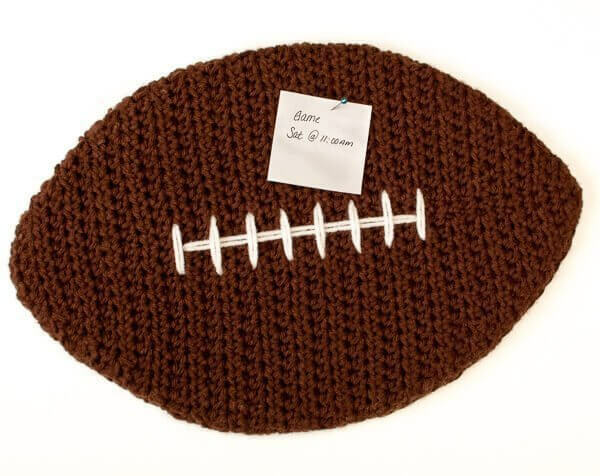 This crochet football cork board is perfect for tacking up sports schedules or showing off special keepsakes. Whether you want to add a sports feel to your child’s bedroom or make some fun decor for your “sports cave”, this cork board is sure to delight! And when you’re finished with this football cork board, stitch up this cool baseball one for a whole sports theme! piece of cork approx. 16 × 20 in. Finished board measures approximately 10 in. × 15 in. With Brown, ch 3 (counts as hdc and ch 1). Row 1: Work 3 hdc in furthest ch from hook, turn — 4 sts. Row 2: Ch 2 (counts as hdc here and throughout), work 1 hdc in same st as base of beginning ch 2, 1 sc in each of the next 2 sts, 2 hdc in last st, turn — 6 sts. Row 3: Ch 2, work 1 hdc in same st as base of beginning ch 2, 1 hdc in next st, 1 sc in each of the next 2 sts, 1 hdc in next st, 2 hdc in last st, turn — 8 sts. Row 4: Ch 2, work 1 hdc in same st as base of beginning ch 2, 1 hdc in each of the next 2 sts, 1 sc in each of the next 2 sts, 1 hdc in each of the next 2 sts, 2 hdc in last st, turn — 10 sts. Row 5: Ch 2, work 1 hdc in same st as base of beginning ch 2, 1 hdc in each of the next 3 sts, 1 sc in each of the next 2 sts, 1 hdc in each of the next 3 sts, 2 hdc in last st, turn — 12 sts. Row 6: Ch 2, work 1 hdc in same st as base of beginning ch 2, 1 hdc in each of the next 4 sts, 1 sc in each of the next 2 sts, 1 hdc in each of the next 4 sts, 2 hdc in last st, turn — 14 sts. Row 7: Ch 2, work 1 hdc in same st as base of beginning ch 2, 1 hdc in each of the next 5 sts, 1 sc in each of the next 2 sts, 1 hdc in each of the next 5 sts, 2 hdc in last st, turn — 16 sts. Row 8: Ch 2, work 1 hdc in same st as base of beginning ch 2, 1 hdc in each of the next 6 sts, 1 sc in each of the next 2 sts, 1 hdc in each of the next 6 sts, 2 hdc in last st, turn — 18 sts. Row 9: Ch 2, work 1 hdc in same st as base of beginning ch 2, 1 hdc in each of the next 7 sts, 1 sc in each of the next 2 sts, 1 hdc in each of the next 7 sts, 2 hdc in last st, turn — 20 sts. Row 10: Ch 2, work 1 hdc in same st as base of beginning ch 2, 1 hdc in each of the next 8 sts, 1 sc in each of the next 2 sts, 1 hdc in each of the next 8 sts, 2 hdc in last st, turn — 22 sts. Row 11: Ch 2, work 1 hdc in same st as base of beginning ch 2, 1 hdc in each of the next 9 sts, 1 sc in each of the next 2 sts, 1 hdc in each of the next 9 sts, 2 hdc in last st, turn — 24 sts. Row 12: Ch 2, work 1 hdc in same st as base of beginning ch 2, 1 hdc in each of the next 10 sts, 1 sc in each of the next 2 sts, 1 hdc in each of the next 10 sts, 2 hdc in last st, turn — 26 sts. Row 13: Ch 2, work 1 hdc in same st as base of beginning ch 2, 1 hdc in each of the next 11 sts, 1 sc in each of the next 2 sts, 1 hdc in each of the next 11 sts, 2 hdc in last st, turn — 28 sts. Row 14: Ch 2, work 1 hdc in same st as base of beginning ch 2, 1 hdc in each of the next 12 sts, 1 sc in each of the next 2 sts, 1 hdc in each of the next 12 sts, 2 hdc in last st, turn — 30 sts. Row 15: Ch 2, work 1 hdc in same st as base of beginning ch 2, 1 hdc in each of the next 13 sts, 1 sc in each of the next 2 sts, 1 hdc in each of the next 13 sts, 2 hdc in last st, turn — 32 sts. Row 16: Ch 2, work 1 hdc in next st and each st across, turn — 32 sts. Rows 17 through 24: Repeat Row 16. Row 25: Ch 2, work hdc2tog, 1 hdc in each st across until 2 remain, hdc2tog, turn — 30 sts. Row 26: Ch 2, work hdc2tog, 1 hdc in each st across until 2 remain, hdc2tog, turn — 28 sts. Row 27: Ch 2, work hdc2tog, 1 hdc in each st across until 2 remain, hdc2tog, turn — 26 sts. Row 28: Ch 2, work hdc2tog, 1 hdc in each st across until 2 remain, hdc2tog, turn — 24 sts. Row 29: Ch 2, work hdc2tog, 1 hdc in each st across until 2 remain, hdc2tog, turn — 22 sts. Row 30: Ch 2, work hdc2tog, 1 hdc in each st across until 2 remain, hdc2tog, turn — 20 sts. Row 31: Ch 2, work hdc2tog, 1 hdc in each st across until 2 remain, hdc2tog, turn — 18 sts. Row 32: Ch 2, work hdc2tog, 1 hdc in each st across until 2 remain, hdc2tog, turn — 16 sts. Row 33: Ch 2, work hdc2tog, 1 hdc in each st across until 2 remain, hdc2tog, turn — 14 sts. Row 34: Ch 2, work hdc2tog, 1 hdc in each st across until 2 remain, hdc2tog, turn — 12 sts. Row 35: Ch 2, work hdc2tog, 1 hdc in each st across until 2 remain, hdc2tog, turn — 10 sts. Row 36: Ch 2, work hdc2tog, 1 hdc in each st across until 2 remain, hdc2tog, turn — 8 sts. Row 37: Ch 2, work hdc2tog, 1 hdc in each st across until 2 remain, hdc2tog, turn — 6 sts. Row 38: Ch 2, work hdc2tog, 1 hdc in each st across until 2 remain, hdc2tog, turn — 4 sts. Lay your football shape on top of the cork board and use a marker to trace the shape. With the X-Acto knife, carefully cut along your traced line. Don’t worry about smoothing your edges because be will be covering them. 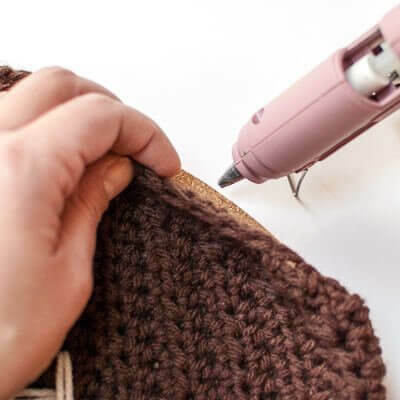 Now that you have your cork board shaped, add an edging to your crochet football by working work 1 sc at the edge of each row around your piece. The edging should curl a bit to wrap over the side of the cork board. Fasten off and weave in ends. Using white yarn and a yarn needle, embroider the finger grip detail as shown in the photo above. 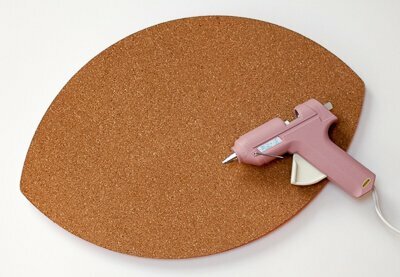 Use a glue gun to attach your crochet piece to the cork board by applying a thin line of glue around the edge. That’s it! Now you’re ready to hang it. I found those Command Hanging Strips (see supplies below) especially useful for hanging this. Have fun! Did i overlook the instructions for the white yarn? Hi Kim :). The white yarn is used to embroider the grip detail. Kara, love all your designs. My son is a coach and I will be making this football corkboard for sure!! How fun! Hope he likes it!! Hi Shirley 🙂 A lovey sounds like such a fun idea! Yes, working with 2 strands and a larger hook would definitely make it bigger. Unfortunately I don’t know of any heart blankets offhand … Ravelry would be a good resource to check. My husband’s quality manager is a HUGH Ohio State Buckeye football fan….I think I’ll be making this for him!